CNEWA - Whatever Happened to Qaraqosh? Family members look down on the streets of Hamdaniya from their balcony. It is said that “history is written by the victors.” What is surprising is how much “editing” the victors often have to do. People who are interested in Eastern Christianity in general and the plight of Iraqi Christians in particular are familiar with the town of Qaraqosh on the Plains of Nineveh in northern Iraq. Qaraqosh is a town of less than 50,000 which has been Christian for a good fifteen hundred years. It is also known as Baghdeda, a name which goes back into truly ancient history. Some scholars believe that Baghdeda existed during the time of the Neo-Assyrian Empire. Indeed Baghdeda may have been the scene of one of the last battles before Neo-Assyrian Empire fell to the Chaldeans from Babylon in 610 BC. Since the beginning of the most recent Gulf War (2003-2011), Christians from all over Iraq have fled north to Qaraqosh or left Iraq entirely. I heard one person recently question if “all the Christians in Iraq live in Qaraqosh.” Problems arise, however, when the curious wish to find Qaraqosh or Baghdeda. Neither can be found on most modern maps. The mystery is easily solved, however. One of the common characteristics of authoritarian regimes is to seek legitimacy by rewriting history. These regimes tend to seek legitimacy by connecting themselves with a real or imagined “glorious past.” Saddam Hussein, for example, portrayed himself in one parade as the new Sargon of Akkad, the great Mesopotamian conqueror three thousand years before Christ! When history does not fit the prevailing ideology of a regime, that history is simply rewritten. Baghdeda or Qaraqosh was an extremely ancient town with roots stretching back 4,000 years. The inhabitants consider themselves Assyrians, the descendants of the great Neo-Assyrian Empire. Whether that is literally true or not, they do not consider themselves ethnically the same as the dominant Arab culture. People in the area speak Syriac, a dialect of Aramaic, which was once the main language of the region. In addition, the town’s population has been overwhelmingly Christian since before the arrival of Islam in the 7th century. Qaraqosh and its inhabitants did not fit the Ba’athist (the political party of Saddam Hussein) portrait of Iraq—a homogeneous, Arab, Muslim country. In an attempt to “Arabize” Iraq in the 1970’s the Ba’athist government changed the name of Baghdeda/Qaraqosh to Hamdaniya. The name refers to the Banu Hamdan, an Arab, Shi’ite Muslim tribe that was politically dominant in the present day northern Iraq and Syria in the 10th century. While Baghdeda/Qaraqosh may no longer be easily found on contemporary maps, it nonetheless remains there as an increasingly important stronghold of indigenous and ancient Christianity in Iraq, where the Christian presence has been drastically reduced since the American invasion in 2003. 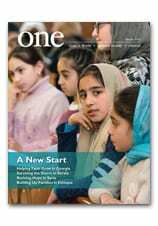 To read more about Christians in Iraq today, see A New Genesis for Nineveh in the November 2011 issue of ONE.